Supporting early engagement between cities and the private sector to accelerate the deployment of climate solutions. Leading cities around the world are searching for innovative solutions to the major sustainability challenges they face, ranging from adapting to the effects of climate change, to providing their citizens with low carbon energy, waste, water and mobility options. However, many cities face challenges when working directly with the private sector. 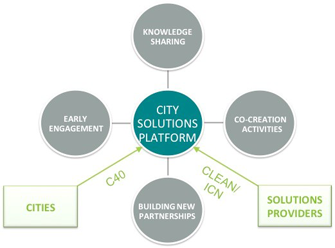 C40 Cities Climate Leadership Group (C40), the Danish cleantech cluster CLEAN, and theInternational Cleantech Network (ICN) have launched the City Solutions Platform (CSP) as a way to support early engagement between cities and the private sector to accelerate the deployment of climate solutions. Build a platform for public and private entities to work together to develop innovative and implementable city solutions on the global stage. 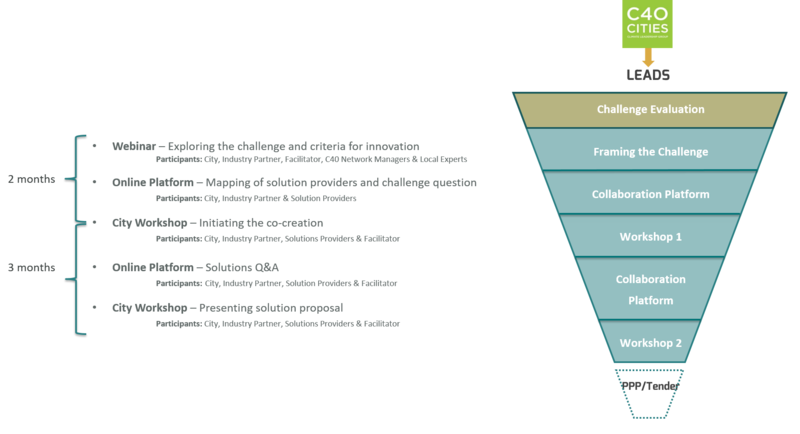 Create an inventory of appropriate engagement models according to specific city contexts and procurement rules and regulations. Provide opportunities for greater international visibility of the innovative sustainable solutions. Build a shared understanding of the nature of the problems faced by cities, the means available to the city to solve them, and the potential for climate action. Develop innovative best-practice solutions for megacities that can be replicated across the network of C40 cities. Melbourne, Rio de Janeiro, Seattle and Sydney have been selected to participate in the first round of the City Solutions Platform. Through the CSP, pilot cities will address a variety of climate related challenges, leading to innovative solutions that can inspire other C40 cities. The City of Melbourne will use the CSP to create innovative approaches to the drainage and flood management in an urban renewal area adjacent to central Melbourne (Arden Macaulay precinct). The CSP will help the City of Rio de Janeiro in implementing innovative financial, social and environmental solutions to treat the organic fraction of its waste, which represents over 50% in weight of total household waste stream in the city. The City of Seattle is looking to the CSP to assist in creating a new policy framework which allows the city to more easily adopt innovative transportation products and services through high-tech and data driven solutions. Finally, the City of Sydney will use the CSP to determine the most effective way to generate 50% renewable electricity by 2030, which is essential to achieving net-zero emissions by 2050. The activities of the City Solutions Platform will be delivered on a pro-bono basis thanks to the support of Realdania and industry partners Danfoss, Hitachi Insight Group, BMW Group and RTI International. There is no cost for selected cities to participate in the project other than to contribute sufficient staff time and resources to be an active partner. Access to the 90+ leading global cities from the C40 Network. Companies having early access in developing tailor-made solutions to complex city challenges. Being part of the process in developing innovative PPPs. Gaining connections to the leading global cleantech companies. Creating solutions that have the potential to be scalable across 90+ C40 cities. 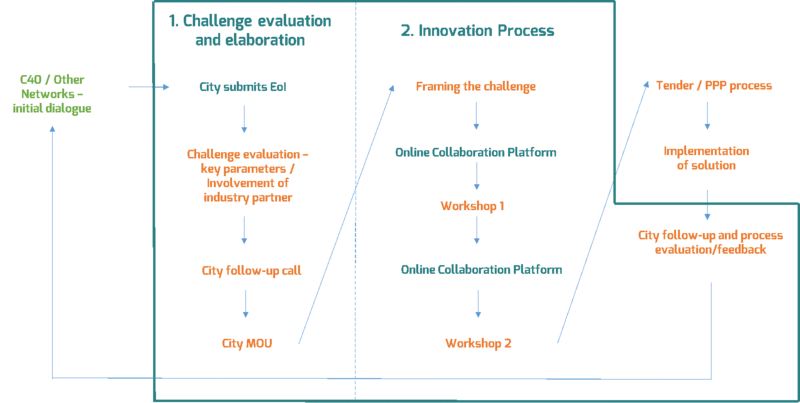 The process for the CSP (figure 1) is divided into 2 phases: 1) the Challenge evaluation and elaboration; 2) the Innovation Process, as shown in figure 1. City challenges are initiated through the use of the C40 Network. The City Solutions Platform will not be part of the tender process; however, both CLEAN and C40 can support the post-CSP process to deliver implementation of solutions using their own platforms and networks respectfully. The CSP process will be coordinated by the Project Management Group (PMG) who ensure there will be a neutral space in which public-private-collaboration (PPC) can be facilitated and that new innovative solutions to the complex challenges cities faced can be developed. A dedicated working group will be established for each city challenge, which will comprise a mix of city representatives, local and global solution providers, a facilitator, and other relevant stakeholders. The working groups will take part in the 5-stage innovation process that is shown in figure 2. The aim of the project is to find solutions for challenges that cities face through an online platform for innovation.